Here’s a quick Chanel-wanna be outfit I put together for Jill yesterday evening. Here’s a funny joke I received from daughter…. The old gentleman paused then said: “Three years ago, my wife ran off with a Florida State Trooper. I thought you were bringing her back. Gorgeous! That skirt is to die for! Oh, I missed this one!!! Coco used to say, “You can be overdressed, but you can never be too elegant.” You look amazing, there is nothing “wanna be” about this outfit! Chanel on the eyes and hanging on the arm is a lot of CHANEL! xo! I would love to be covered in Chanel from head to toe….if only I had a money tree…. That’s definitely a new one! Fortunately, my speeding days are well behind me so I don’t have to worry. My speeding days are over too…. I’m lucky if I can see where I’m going without my glasses! Getting old is not fun! i have been out of town for a week, but i must have missed the memo that pearls are on the way back in!! you are the 3rd blogger that has worn them this week and i have 2 friends that were blinged out in pearls at a b’day breakfast on friday. back in the 80’s i never ever took my pearls off!!! Hope your weekend was fun!! Very Coco! And i loved the joke! I love this outfit! My dad would have liked this joke. I think there’s something sweet about this joke….maybe b/c we love “young at heart” folks?! Sorry your dad isn’t here to laugh with you. you can never go overboard with pearls!! the jacket is so nice!!! Oh my gosh I don’t know what I liked better, the outfit or the joke! You look beautiful in your Chanel inspired outfit, but that joke was really funny. Coco….I mean Jeannie, you are looking very French! The outfit is wonderful – I love all the little details. The joke is hilarious, I’m going to modify it so I can use myself someday…. Haha, I wish I were Coco! Thank you Elisa! My weekend was a busy one…just got home from getting son moved into his new place. Whew! Hi Jeanie! You are charming, pretty, and hilarious all at once! Thank you for the great outfit and joke. Always a pleasure!! Love the layered pearls! Makes me want more in my jewelry box! Hi Sarah! Me, too! I saw a gorgeous strand of Tahitian black peals while in Hawaii, and I’m kicking myself for not picking it up. Thanks for stopping by! This look is right up my street – you probably remember how much I LOVE LOVE LOVE pearls. The truth is that if I wasn’t a fashion blogger and didn’t need to reinvent myself every now and again I would forever wear the style that you posted here. It’s so classic, so feminine. You have NO idea how much I am in awe with this style post! Love the BCBG skirt, the amazing Chanel accessories. Btw, I have just started reading a bio on that woman, clever girl, she was! Edita, I do remember how much you love pearls! You can never go wrong with timeless classic…just not too practical sometimes. Love the quote and the outfit! Pearls never go out of style…. Hi Jeannie! You look gorgeous and such a good sense of humour you have! I love this look and your blog too. You are so darned cute with your jokes! Thank you for participating in HIWM this month. 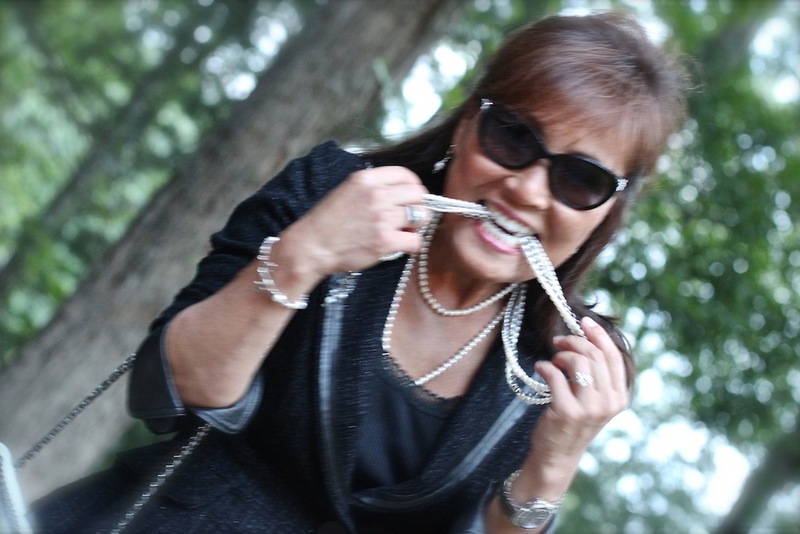 I think Coco Chanel herself would approve of your look…classic black and white, pearls and I think you’re the only participant who sported a Chanel bag and glasses! It was fun putting together Chanel-esque outfit. B&W with pearls! Adore the outfit and the shoes … I saw a pair similar on a sale here earlier this month but they did not have my size. I need to replace my snakeskin lookalike shoes. Thanks Wendy! We love our shoes, don’t we? I thought it was hilarious, too! You look very elegant in your Chanel and your pearls! Love the gorgeous pearls!!! They are so versatile yet ladylike! I agree! It’s classic & elegant, but it would look just as wonderful with jeans & t-shirt, imo. Glad I could make you laugh cuz you always make me smile! The joke made me laugh out loud! You look diving in your stack of pearls. I think it’s the best way to wear them! No, you don’t look like you’re diving!! You look DIVINE! Great quote and lovely outfit! What a great quote to start of my day (the Chanel quote). And no, you can never wear too many pearls. She was definitely a women’s woman. I love her quotes and her philosophy of life. Pearls are girl’s best friend? Well, close second to diamonds in my book! Very classy outfit!!! LOVE the shoes (I was just looking at high heels like this yesterday–and sighing at days gone by . . .). Anyway, loved the joke!!! I’m a little slow with jokes, too, but I got this one. Hilarious. Glad it made you laugh. I like simple jokes, too! I just don’t get the other kind…you know…guess I’m just dense. You look beautiful and very Chanel! This was a fun tribute to partake in….have a great day and watch out for those flashing lights in the rear view mirror!! Funny joke! Sounds like something my hubby would say! Pearls are the best!!!! Every lady should own a few strands. Ummm, you do look good, guess I’ll go buy that jacket I’ve had my eye on of late. Love that Chanel style! Judy, go buy that jacket! You can never go wrong with a classic jacket.